With his passing last week at the age of 90, Chuck Berry, one of rock ‘n’ roll’s undisputed forebears and originators of the form, left behind one of the most important canons in the history of popular music. Without Berry’s signature sound, music history’s entire cultural plain might never have shifted, and the mindset of an entire generation may have been forever altered. Rock ‘n’ roll may still have happened without Chuck Berry, but it’s hard to imagine how. Certainly there’s no denying the impact of Elvis, Little Richard, Jerry Lee Lewis, The Beatles, The Stones and the like, but without Berry’s early influence and later guidance, the impetus might have been missing. More than anything, Berry created the template for a sound that lingers to this day—in spirit, sensibility, form and purpose. He gave voice to a restless generation of post-war adolescents and instilled in them a rallying cry. He defined rock’s rebellious nature in style and sound while breaking down the barriers that created America’s racial divide. He was, as so many have described him, rock’s poet laureate, and for that, we shall always be in his debt. Here are 18 of his best works. Famously covered by The Rolling Stones, The Beatles, The Yardbirds, The Doors, The Flamin’ Groovies, Charlie Daniels and Status Quo, just to name a few, “Carol” finds its singer pleading with the girl of his dreams not to allow another man to steal her heart away. His solution? Learning to dance if it takes him all night and day. The ‘50s were an easy time, indeed. All it took was knowing some cool moves in order to realize romance. A song about love at first sight, “Nadine” finds Berry instantly enamored, but somehow out of step with his desire. “Every time I catch up with you, you are up to something new,” he complains. It’s hard to get a handle on that lady, but for Berry, the rocking rhythms remain absolutely intact. Berry’s attempt to convince his fans that he’s rapidly approaching maturity somehow falls flat when it becomes clear that he’s only out to impress his girl. He’s clear on commitment, having left his wilder days behind. Somehow, we find that hard to believe, and even harder to conceive, especially with the the crawling bass line and 12-bar blues structure that still makes you want to swing. “Rock and Roll Music” was the signature song for the new sound Berry helped usher into the modern era. This tune made it clear that while he had “no kick against modern jazz,” you had to choose that rock ‘n’ roll music if you want to bop with Berry. A paean to underage romance? Perhaps, as theorized later. But back in the mid-to-late-‘50s, seemingly all of Berry’s fans were of that tender age. Besides, the reference to “rockin’ on Bandstand, Philadelphia P.A.” made it clear that despite “the grown-up blues,” the intention was nothing more than a prolonged spin on the dance floor. And really, what could be wrong with that? An easy, ambling reflection of carefree existence, devoid of pressures and predetermined intent, “No Particular Place To Go” is the song every rock ‘n’ roll tune aspires to be. “Can you imagine the way I felt?” Berry sings when his romantic plans get snarled by a safety belt that simply won’t budge. A perfect evening with his sweetheart laid to waste by mechanical devices. It may be an exaggeration to call this the song that put Memphis on the map, especially given the city’s gilded musical legacy, but Berry made it clear that it was indeed the place he needed to be…at least as far as reconnecting with his beloved Marie was concerned. And if it was good enough for Mr. B and Elvis, who are we to argue? For a man whose criminal charges still tail his musical legacy, we can only imagine what kind of monkey business he means here. Move over Francis Scott Key; this is the song that rightfully deserves to emerge as our new national anthem. “I’m so glad to be living in the U.S.A.,” Berry sings with undiminished pride. Despite all the obstacles he was forced to contend with—social, politically and culturally—he knew that when it comes living free, America is a hard place to beat. 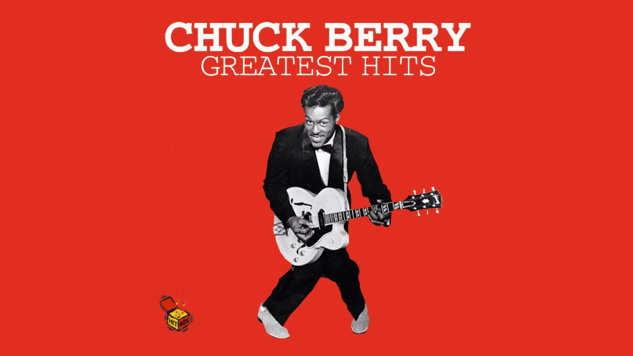 No doubt when The Beatles sang “Back in the U.S.S.R.,” they had Chuck Berry in mind. One of several women and apparent paramours referenced in his songs, Maybellene apparently had a problem remaining faithful to her would-be beau. But instead of serving up self-pity, Berry chooses instead to up the ante with a feisty little rocker that laments her wild ways while adding a subtle hint of admiration for this wild child. It became one of Berry’s most popular and enduring hits. Easily the silliest song in the Berry canon, this late arrival was a surprise hit when he released his version of Dave Bartholomew’s 1952 novelty hit in 1972, gaining his first No. 1 in the process. Despite the questionable lyrics and double entendre, Berry gained renewed acclaim, helped in part by the album from which it came, The London Chuck Berry Sessions. May that ding-a-ling ring forever! The rhythms were the same and the push for persistence was clear, but now, directed towards that reindeer at the head of Santa’s pack, this timeless Christmas classic was very much in keeping with Berry’s musical motif. His drive, determination and humor were pumped up to full throttle. In case anyone had their doubts, “Reelin’ and Rockin’ made it clear that these two moves were all that were necessary to ensure total liberation and accede to those rocky rhythms. Berry’s frequent run-ins with the authorities could have prompted the subtext for this song, but the actual intent likely had more to do with his determination to keep playing the field and not get caught up in commitment. The song’s steady pace emphasized his efforts to remain one step ahead of his pursuers. Was Chuck succumbing to some vain sense of self praise, or owning up to his criminal convictions? A brown-eyed handsome man indeed, he didn’t need to coax his fans’ admiration. Charismatic to a fault, he was a master showman with the presence and flair that helped define the image of that perfect performer, one able to mesmerize the crowd on the strength of both his moves and mannerisms exemplified in this song. When Chuck Berry sang “Up in the mornin’ and out to school / The teacher is teachin’ the Golden Rule / American history and practical math / You studyin’ hard and hopin’ to pass,” he effectively encapsulated the daily hopes, fears and pressures of every American teenager.The average student has never had a better advocate in rock, either before or since. “Roll Over Beethoven” has become a standard, repeatedly revived through the ages and now considered a veritable rock anthem. The Beatles added it to their set list early on, and with the dawn of the progressive era, the Electric Light Orchestra retraced its origins, adding the symphonic sweep that Berry eschewed in his original. Although it was a decided put down of an archaic style, it was also an affirmation that a new sound in the form of this “rockin’ little record” had truly arrived. “Johnny B. Goode”is an accredited candidate for the number one rock ‘n’ roll song of all time. Berry never faltered in his perpetual forward motion and musical boundary-pushing, and it’s likely his continued influence won’t either. Go, Johnny, go!